Sadly, we missed the Strangebrew Festival this year. Instead of heading west to Port Townsend for a weekend of fun and frivolity, we flew south to Palm Springs to conduct important research on the status of the craft brewing industry in California’s Coachella Valley. After all, some one has to do it. In this story, we’ll explore the beer scene in Palm Springs and head west to one of California’s brightest, newest brewing stars: an up-and-coming brewery in Redlands. We visited two grocery stores in Palm Springs, Alberstons and Ralph’s, where we found a decent selection of craft beer. We immediately stocked the fridge with good beer. If you go to Palm Springs, we advise you do the same. We enjoyed Firestone Walker DPA at a pizza place called NYPD, which stands for New York Pizza Delivery. Clever. 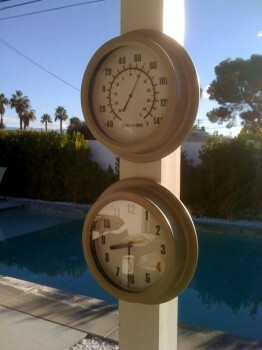 It is located in the heart of Palm Springs on South Palm Canyon Drive (the main drag). The beer lineup included a full compliment of Anheuser-Busch beers, plus Firestone Walker DBA, Widmere Hefeweisen, and Kona Longboard Lager. Like I said, I have a hunch the A-B distributor runs the show around here. The bartender told us Firestone Walker was on tap at a couple other places around town, but otherwise knew nothing about beer. The music was loud and the X Games were on the tube. We would gladly drink at NYPD again, assuming they continue to have at least one solid craft beer option. While there, we were entertained by some hard-drinkin’ retired cops. Perhaps they didn’t get the memo about the Pizza Delivery thing and thought this was a cop bar. Perhaps we didn’t get the memo and it was. Whatever the case, we like this place. Quite near NYPD we found Hair of the Dog – the only English pub in Palm Springs. This, we thought, would be a good place to get good draft beer. At Hair of the Dog we found Bass, Boddingtons, Newcastle and Guinness. The craft beer selection included New Belgium Fat Tire, Sierra Nevada Pale Ale, Widmere Hefeweizen and Widmere Drop Top Amber. While Hair of the Dog was a perfectly peachy place to tip a pint and watch a rugby match on the tellie, it seemed like it was our duty to Queen and county to move along and continue our noble quest for good beer farther down the road. In most places, pub means beer. Around Seattle, it frequently means lots of beer. With that in mind, we paid a visit to the Village Pub. Like the previous two bars, it’s on the main drag in downtown Palm Springs. This is a casual place where they play classic rock way too loud, earning them an immediate smiley face in our travel book. After dinner, the crowd turns over and bouncers show up at the door. On this Friday night, the Village Pub was replete with women dressed in clothes that were both age and weight inappropriate, and hootin’-n-hollerin’ local boys who seemed to like it that way. The boys pounded down yellow beers and the girls sucked on tall drinks with long straws. The band –the same band that’s been playing the Village Pub twice a week for 11 years– pretty much rocked the house, cranking out classic rock favorites. At the Village Pub, we found a house beer called Village Idiot Ale – a perfectly serviceable amber. It was a simple beer and not at all offensive. It was not overly sweet nor was it overly hopped. It was entirely unsucky. It was surprisingly consumable. I asked, “Who makes this beer for you?” Our server did not know and apparently figured nobody else working at the bar would either. From the look on his face, I’ll assume it was brewed by Deer in Headlights Brewing. Seriously, you’d think I was the first person to ever ask the question. Maybe I was. Twenty minutes to the east of Palm Springs, in Rancho Mirage, there is a Yard House Restaurant – a national franchise that offers 150 draft beers. Reviews on Ratebeer.com suggested that we should not waste the gas or time. As one reviewer said, “Every imaginable brand of American swill, Euro swill, and a few flagship beers from America’s largest craft breweries.” Been there, done that. Still farther to the east, in the sprawling suburban metropolis of Indio, you will find Back Street Brewing (Lamp Post Pizza). It is very new. Everything in Indio is very new. Quite by accident, we drove through Indio on our way back from Joshua Tree National Park. I swear, the entire city looks like it dropped from outer space two years ago. It frightened us. We learned that Back Street is a chain of breweries in Southern California that recently took over a place called Lamp Post Pizza. We read some less-than-favorable reviews of the place and the beer – overpriced, uninspired beers. Still, they say there is a brewery in Indio. Someone braver than I will have to confirm it. We found a great brewery in Redlands – Hangar 24 Brewing. (Pictures below.) As the name might suggest, they’re out at the airport. 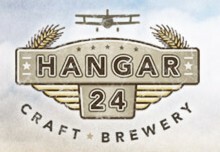 Hangar 24 was founded by Ben Cook, a graduate of the UC-Davis Master Brewers Program, a pilot, and an impressive entrepreneur. The brewery is growing. They opened in March 2008 and produced 1,100 barrels that year. In 2009, they more than quadrupled that number. The person brewing the beer at Hangar 24 is Kevin Wright. When we visited, neither Kevin or Ben were available. Apparently they were on their way to England to accept an award. Kevin won the J.S. Ford Award, given annually to the earner of the top score in the London-based Institute of Brewing and Distilling’s general certificate in brewing exam. Cheers to that! We arrived at about 3:00 on a Saturday afternoon and found their taproom overflowing into the parking lot. This place was rockin. Hangar 24 was the place to be in Redlands, CA. The endless stream of locals coming in to fill growlers was amazing. They sell bottles, growlers and kegs to go. And they sell a lot of them. We must have seen them fill 30-50 growlers in the time we were there. A pick-up truck backed up to the garage and loaded 10 cases of bottles. Hanger 24 offers a full compliment of beers. We were particularly impressed by the Porter, which was robust and full-bodied. Not quite an imperial, but big. Their Pale Ale and their IPA did not disappoint. My favorite was the Helles Lager. Kim’s favorite was the IPA. Renowned travel author Rick Steves says that in order to have a truly great travel experience you need to get out of your comfort zone. While he might be talking about eating strange foreign foods and trying to communicate without the luxury of a common language, for me getting out of my comfort zone involves fruited beer. You literally drive through orange groves getting to Hangar 24. This is the Inland Empire, after all. To pay homage to the agricultural history of the area, Hangar 24 produces an Orange Wheat ale. I believe they consider it their flagship. It’s good. I mean, it’s really good. It was perfectly balanced, with just enough orange to make the point. It was refreshing and effervescent. Because an Orange Wheat ale is so far from my comfort zone, and is something I would usually choose to avoid, I might need to revisit this one to make sure it is as good as I remember. We met some really nice people at Hangar 24. Some local guys, who seemed to know a little bit about beer, were quite interested to learn that we were from Washington. They raved on and on about their great California beer. They were fans of Stone, Firestone Walker, Port Brewing and Lost Abbey, and some other breweries with which we were less familiar. We told them that we drank those great California beers in Seattle. We also told them that there were plenty of people in Seattle who thought California beer was better than Washington beer. That’s when one of the guys began to tell us about an amazing beer that he drinks every time he’s in Seattle. He claimed that it is better than any beer he’d had in California. He raved about this magnificent, mysterious beer from a distant land. He lit up when he talked about it like he was talking about his first real girlfriend. He didn’t remember the name of the beer. All he could remember is that he drank it in a couple of different bars and that his buddy had to bring it home in growlers because you can’t get it in bottles. The only other thing he remembered about this amazing beer was something about Africa and a lion. We never did figure out what beer he was talking about. Our advice? Don’t worry too terribly much about beer when you visit Palm Springs and the Coachella Valley. Stock the fridge so you have something to drink at day’s end. If you’ve got a car, go find a brewery somwhere. Obviously we recommend Hangar 24. Go to Joshua Tree National Park. It’s amazing. Hike Palm Canyon. Take the tram to the top of the mountain. Ride bikes. Swim. Lay in the sun. Eat breakfast on the patio at 8:30 a.m. in January. Do all those things that you cannot do here in Washington. The beer will be waiting for you at home. “The only other thing he remembered about this amazing beer was something about Africa and a lion. Probably Mack & Jack’s African Amber. Mrs. Beer Blog here. My husband was being sarcastic about the Mac & Jack’s, we did know what the guy was talking about. Sorry for his sometimes vague sense of humor. We thought it was funny that this guy called out Mac & Jack’s as his fave when he lives spitting distance from Stone. But he said he normally drinks lagers, so he was branching out with the M&J. Comedy’s tough. Many readers “got it.” Don’t stop. The humor rounded out a great, information packed article. Oh ya, that’s right! Mac-n-Jack African Amber has a lion on the tap handle and stuff. How incredibly thick of me to miss that! Thanks for the great insight on Palm Springs. We’ve talked about going there for a while but just haven’t done it. When we do go, we’ll be brave and try Back Street Brewing. yeah, that part of cali doesn’t have much going for them in terms of beer. but you totally missed out on bevmo? i’ll just say, when we went to indio for phish – we looked for breweries and that lamp post place was no good. bevmo saved us! Thanks for the great insight-Firestone Walker is out of Paso Robles I am going there with some friends for the first time in a coulple weeks. It is owned by the Firstone Family that also has a winery and the Tire company. They filmed the tv show The Bachelor at the winery when Andrew Firestone was the Bachelor…. As far as Hanger 24 there beer is incredible. Another good beer is there local secret which is called Rotten Orange it is a mixture of there Orange Wheat and Alt. At there one year Anniversary Party they had a Blood Orange that was amazing, even better than the Orange Wheat, I believe the alcohol content was 10%. They only did the brew for the party even though many people requested it, they have not brewed it again. I would recommend Hanger 24 to anyone it is worth the drive, it is kind of a hour away from everything—-A hour from LA, Newport Beach, Palm Desert and Big Bear….. I enjoyed this article greatly because I currently live in the desert but grew up in Redlands. Those of us with Redlands roots are proud of our hometown brewery! As for the desert, all I could do was nod my head in agreement. We are sorely lacking out here when it comes to the beer and pub scene. Back Street Brewing is about a mile from my home in La Quinta (not Indio). I never go there for pizza or beer. The Yard House is a loud, busy restaurant. But at least they have some good beers to choose from in, as you said, this “barren badlands of beerlessness.” We take what we can get out here!